Exploring Tennessee's Caves for New Species Running underneath the rolling hills of Tennessee lies a still-mysterious and remote network of caverns. 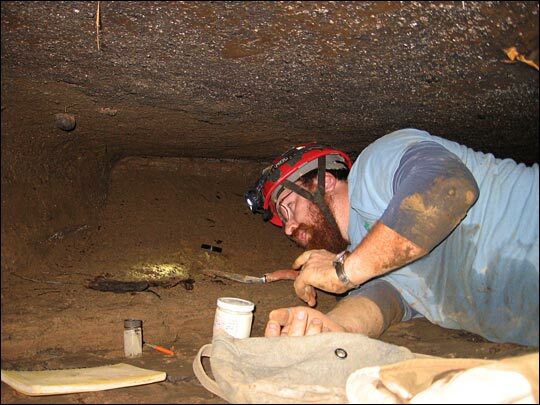 Many of those caves shelter fragile ecosystems, and biologist Jerry Lewis is helping to discover and protect some of those ecosystems from man's destruction. Cory Holliday of The Nature Conservancy baits a pitfall trap using rotten Limburger cheese to lure tiny insect species that live in Tennessee's caves. 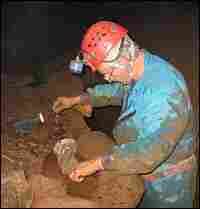 Biologist Dr. Jerry Lewis squeezes into a cave crevice to strain a pool of water to collect creatures for further study. Not everyone views caves as living, fragile ecosystems. 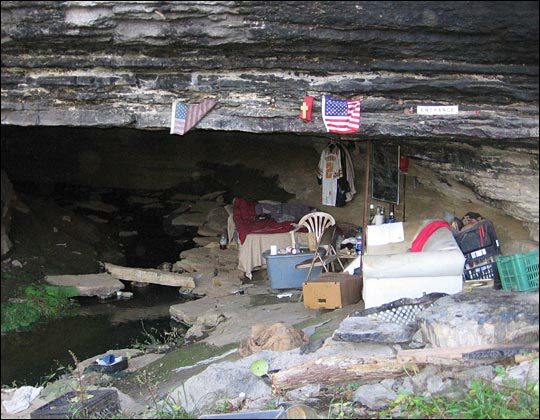 Here, a modern-day cave dweller decorates his "home" with a hodge-podge of household items. The walls are sprayed with several layers of graffiti paint. Running underneath the rolling hills of Tennessee lies a still-mysterious and remote network of caverns. Home to more than 8,000 caves, much of the state is considered karstland. This means the layers of rock under the soil are easily hollowed out by ground water through a slow dissolving process. Many of those caves shelter fragile ecosystems. Biologist Jerry Lewis and Cory Holliday of The Nature Conservancy are helping to discover and protect some of those ecosystems from man's destruction. The allure of Tennessee's subterranean world has led to many amateur expeditions. Some of those journeys have ended in tragedy -- either from loss of human life, or destruction and disturbance of fragile cave ecosystems. For this reason, Lewis, his fellow biologists and serious cavers are reluctant to reveal the locations of some of their favorite spots. Living in an environment devoid of light and organic nutrients, cave organisms have evolved unusual adaptations to survive. Some species of fish are blind, and other creatures that still have eyes flee frantically from outside sources of sensory stimulation. Nothing is wasted in this environment -- for insects and many other life forms, bat guano is a dining option of choice. NPR correspondent David Kestenbaum joins biologist Dr. Jerry Lewis underground outside Nashville as caves are inventoried and explored for new and threatened species. 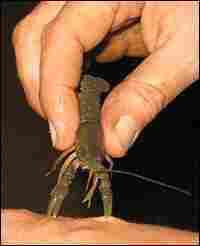 For Lewis, each trip below ground has the potential for a "bugasm" -- the discovery of a new species. The first time Lewis had a "bugasm" was when he was still in college. He went caving for fun, found a mysterious creature and sent it in to the Smithsonian Institution. It turned out to be a new species. Lewis serves as an independent consultant to The Nature Conservancy and other conservation organizations interested in understanding the endemic species that live just below the surface of the earth. But even keeping a cave location secret doesn't always keep it safe from human activity. Sewage discharges, refuse dumping, even trash thrown into sinkholes can find its way into the deepest parts of caves, with serious repercussions for the fragile ecosystems below ground. 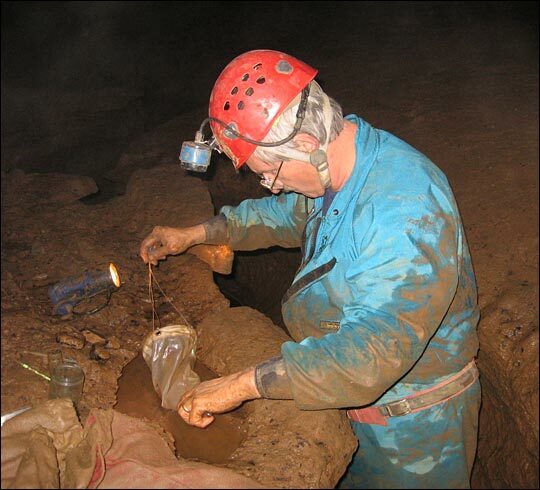 On this Radio Expeditions journey, Kestenbaum visits several caves ranging from pristine dwellings frequented by transient bat colonies and minute crustaceans to a disconcerting example of a cave so badly polluted, it is devoid of life. This report was produced by Jessica Goldstein.